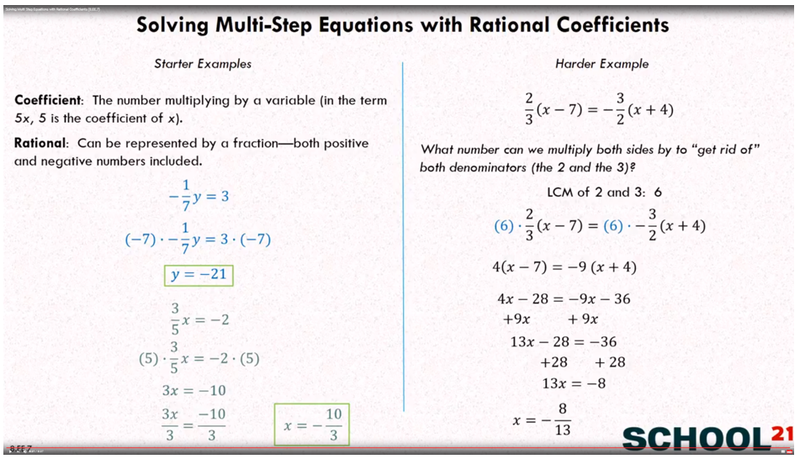 Examples, solutions, videos and lessons to help Grade 8 students learn how to solve linear equations in one variable. I can solve linear equations with rational number coefficients. I can solve equations whose solutions require expanding expressions using the distributive property and/or collecting like terms. Coefficient: The number multiplying by a variable. Rational: Can be represented by a fraction - both positive and negative numbers included. On MOnday, David rides his bicycles m miles in 2 hours. On Tuesday, he rides three times as far in 5 hours. If his average speed for two days is 12 mi/h, how far did he ride on the second day? Round your answer to the nearest tenth of a mile.